This album was set to mark the return of Keith and Robert as ‘3.2’ - a record that was in the planning stage when Keith passed away on March 11th 2016! ‘Rules Have Changed’ comes with a really informative 20-Page Booklet containing lots of pictures & memorabilia. The working relationship between the legendary ELP keyboard player Keith Emerson and singer / multi-instrumentalist Robert Berry started in 1987. Iconic manager Brian Lane (YES, ASIA, IT BITES) and Carl Palmer arranged a meeting between the two prolific musicians. The plan was to form a more melodic, song oriented band (compared to ELP), which would allow Emerson, Berry and Palmer to follow in the footsteps of the success that ASIA and GTR were enjoying in that period. The result of that collaboration between Emerson, Berry and Palmer was the band 3, and the album '… To The Power Of Three' released worldwide by Geffen Records in 1988. The first single: ‘Talkin’ ‘Bout’ reached #9 on the Billboard Magazine charts and the band toured the US to support the album. With the success of the first release, Geffen urged the band to go back into the studio to begin work on a second album, but Emerson felt uncomfortable with Geffen’s momentum stifling, inconsistent strategy that ultimately cut the first album’s success short, consequently prompting the band to call it quits. At the time of their break-up several songs were already written for that second release (later released on Robert Berry’s solo album: ‘Pilgrimage To A Point’). In October 2015, conversations about a new 3 album started between Robert Berry and Serafino Perugino, as Robert had been speaking to Keith about releasing the long delayed 3 follow up album. Along with renewed fan interest in the band and those conversations, Berry had sparked revived enthusiasm from Keith Emerson for pursuing the project. 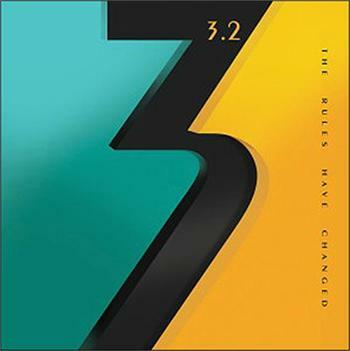 The exchange of musical ideas and song collaborations ultimately paved the groundwork for this new release to be called ‘3.2’. Everything was set. Song ideas, studio time, record contract… and then, that dark day! Emerson’s untimely death made the album an uncertainty. Robert was left with Keith Emerson’s final musical ideas for the project. From old cassette tapes, keyboard parts written over the phone, to long discussions about style, the framework of the album was set and ready to be produced. The final result is ‘3.2’, a reboot of the original 3 project, centred on Robert Berry’s amazing talents. This is a record that deserves to be heard by each and every fan of the great Keith Emerson and includes some exquisite musical parts, which every Progressive Music fan will be delighted to indulge in. ‘Rules Have Changed’ was recorded at Soundtek Studios, Campbell, CA. It has all been produced, mixed and played by Robert Berry, with the songwriting and arrangements by Keith Emerson and Robert Berry. ‘One By One’ opens with a melodic piano intro before busting into a powerful anthemic song with a Moog solo halfway though followed by a jazzy piano solo before the lyric returns and then there’s an Emerson style Hammond run towards the end of the piece which, in true ELP fashion, closes in a climactic conclusion. ‘Powerful Man’ intros in true later day ELP style with blazing synth melody together with powerful bass and drums for another anthemic blockbuster … quite a sound for a virtual on man band! ‘The Rules Have Changed’ is more of an AOR ballad full of massed synth chords with a big chorus. There’s another blazing instrumental break near the end where Berry captures the sound of ELP in bombastic impov territory! ‘Our Bond’ is another ballad style track with piano intro, but after the lyric comes along there’s a short synth fanfare. Basically it’s a stripped back song with a strong instrumental passage tagged on at the end which is more just than a bit like ‘Tarkus’ at times, and there’s an echo or two of ‘Fanfare For The Common Man’ sneaking in there too! ‘Somebody’s Watching’ sounds very much like later day ELP during the opening instrumental salvo of keyboards, and that feel continues on throughout the entire piece. The song has a curious and unusual mild hint of the Celtic to it in places! There are some really nice Hammond runs in the middle instrumental break and together with the bass and drums a formidable sound is created, all topped off with a terrific Moog solo towards the final minute. ‘This Letter’ starts out as a stripped back acoustic guitar driven song with just some piano included in the early part of the arrangement, then it develops into a full blown keyboard work-out in the second half with a string synth arrangement, an accordion (or a synth version of it) solo and finishing off with some racey synth soloing towards the close. ‘Your Mark On The World’ opens in real ELP style with a salvo of keyboard runs over powerhouse bass and drums. Screaming electric guitar gets a look in too before Berry’s vocal strikes up. Not too far in there are some great keyboard solos together with Hammond, piano and blazing synthesizers. Overall … while the production and sound is essentially of Keith Emerson, the songs are very much Robert Berry … well written and the vocal delivery is excellent. What has to be lauded is Berry’s amazing skill on all the instruments - he really has captured the spirit and essence of Keith Emerson on all the keyboard parts! All ELP fans should own a copy of this! ‘Rules Have Changed’ is released on 10th August 2018.